Golf Shirts Johannesburg - Are you looking for an item of corporate clothing that looks cutting edge and still has that classic charm? The Golf Shirt is the best of both worlds, and we'd love to help you find the golf shirt for you! They’re the perfect combination of smart and active that can be worn in both the office and on the playing field. They’re designed to be comfortable, breathable and to have a full and unrestricted range of motion. This makes it an ideal school and corporate uniform as well as a beautiful option for corporate wear. As the ultimate in smart casual office wear, we have a range of corporate golf shirts. Golf Shirt Supplier Johannesburg – If you’re looking for Golf Shirts Wholesale Johannesburg, then you’re definitely in the right place! Brand Innovation is a premier Golf Shirt supplier in South Africa, with a selection of awesome, quality golf shirts that we supply in bulk. And with our awesome Promo Jozi web store you can buy your golf shirts online, so you can browse through our collection at your leisure. We really do have something for everyone in our selection of shirts. Because Golf is a sport that can be played by any age group and any body type, we cater to everyone from tiny tots to grownups and all the way up to 5XL. No one should be excluded from sport, or from having an awesome golf shirt. Of course, Golf shirts aren’t just for golf, though they do look very dashing on the green. 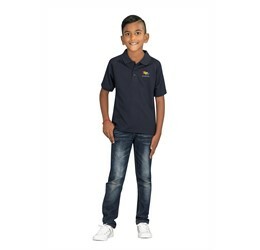 These are awesome, versatile shirts that can be used for everything from a corporate uniform to a sports team shirt, even as a part of a school uniform. Uniforms are a way of bringing people together with the same ideals and goals in mind. Golf does the same thing. You can learn a lot about someone’s character when you play golf with them, just the way you can when you work together with someone on a team. Golf is a game of strategy, patience and skill, and it’s easy to see who has the dedication and skill to take it further. When you work with someone as a part of a team, it’s easy to see if they have the dedication and drive, as well as the social skills to achieve in their chosen field. Size does matter, especially when you’re picking out a corporate uniform shirt that you’re going to be wearing regularly. You want to have something that fits you well and is comfortable. The more comfortable you are in your clothing the more easily you’ll be able to do your work. But at the same time, how you look can affect your mind set and whether you want to work. There are many different body types out there, and everyone deserves something that fits them well and makes them feel comfortable. A corporate uniform should be something that makes doing your job easier, whether it makes you more recognisable to customers or allows you more freedom of movement when you’re doing your work so that you can do it to the best of your ability. Golf Shirts are great for this because they’re sports shirts first and foremost. They are designed to allow you the most freedom of movement and breathability when you’re playing, so that you don’t have anything holding back your golf swing. That same feature means that you can pick up boxes, reach for things on high shelves and turn around unrestricted by your clothing. People come in all sorts of shapes and sizes, it’s just the way that we’re made. Which means that offering plus size golf shirts and plus size clothing in general is the natural thing for Brand Innovation to do. We want to spread the smiles and give people corporate uniforms that fit well. Having clothing that fits well and makes you feel good about yourself is one of the first steps to owning your day. And just like with our grown up golf shirts, you can buy these golf shirts online from our web store. 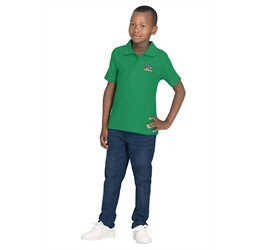 Using golf shirts as a school uniform lets kids be kids while still looking neat and tidy. There are few things in the world more adorable than a child dressed in their smartest clothes. Which is why we offer a range of golf shirts for children as well as for adults. 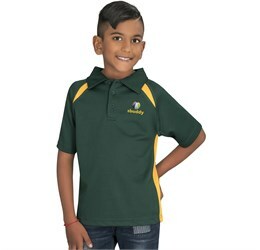 These awesome golf shirts make great uniforms for children because firstly, they look really cute! That little collar is a great introduction to a full on collared shirt and they’re easier on little fingers. Secondly, they allow children the freedom to run around and play, and just be kids. Because golf shirts don’t restrict movement, it’s a lot easier to play high energy games without getting your uniform all scuffed up. Golf shirts are a lot more hardy than, say, a pair of stockings. Yet another reason to choose Brand Innovation as your golf shirt supplier is that we supply golf shirts in bulk. That means you can get all your uniforms done at once, and it works out to be more cost effective for you. We’re all about helping our clients, and we want you to get your golf shirts at the best price, whether they’re for a school uniform or a corporate function. A men’s golf shirt is cut for comfort and easy of movement so that you can really get into it on that back swing and drive that ball. 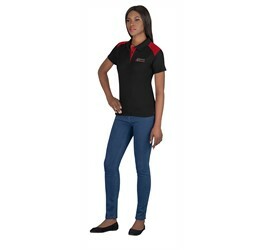 Which copies across well into corporate smart casual because you can do everything you need to do, and they look great. It’s traditional to have golf shirts with pockets, so that you can keep your score card on you while you’re playing. What’s not traditional is having any kind of branding on your golf pocket. But here at Brand Innovation we’re all about thinking outside the box, which is why we can brand your golf shirt pockets for you if you want. Golf is a gentleman’s sport. It comes with rules and a dress code. The name golf is said to come from the name, “Gentlemen Only, Ladies Forbidden”. Of course these days that rule has been thrown out and women and young girls are welcome to play golf, and in fact play golf very well. It’s also been found that that acronym is wholly untrue and that Golf is much more likely to be derived from the archaic Scottish word gowlf (which is a spelling free for all, so long as it looks sort of like it should sound). Golf is everyone’s game, and that’s why we have a range of different styles of golf shirts, including ladies, children and unisex. Ladies golf shirts look great. They’re usually more fitted than men’s shirts to five them a more flattering, feminine look. Most of our styles have men’s and ladies counterparts so that you can have a corporate uniform that looks just as good on both! Looking good is important, not just for your company’s image but for your own sense of self-worth too. When you look good and feel comfortable while looking good then you are more likely to feel like you can succeed. There’s a reason that dressing for success is popular. Looking confident and competent can help to make you feel confident and competent. It’s also called faking it till you make it, and there have been studies on it. There’s also a very interesting TED Talk on the subject on the matter by Amy Cuddy. That talk applies to body language, but the same principle can be applied to appearance. Which is yet another awesome reason why you should choose a golf shirt as your corporate uniform. They look very smart with their collars and placket necklines, and they feel great. A unisex golf shirt is a great gender neutral uniform option. Gender neutral uniforms are often used by schools, especially primary schools. They’re also a really great option if you don’t necessarily want to buy two different shirts for your uniform. Having a gender neutral uniform can also be an issue of modesty. Because women’s cuts are often more fitted, they tend to reveal more of the figure – though not the skin. That can still make someone uncomfortable and feeling comfortable while you work can help you work at your optimum. A happy employee is a productive employee and a really great way to ensure your employees comfort and happiness is by giving them an option that they will feel comfortable wearing. It doesn’t matter what size, body type or gender you are, everyone can rock a golf shirt. Online shopping is one of the most popular ways to buy things. Why slog all the way to the store? You can just add the products to your cart and get your pricing from us. Online shopping makes life easier. A web store is great tool for the busy shopper who just doesn’t have time to go out and get things. It’s also a great tool for the busy marketing exec who needs to organise three events for next month on top of the day to day work and just doesn’t have time to go and source options. Brand Innovation is a team of passionate and caring people who want you to have the best event and really great corporate merchandise. And when the event is large you can also do a golf shirt bulk order. That way you can have as many corporate products as you need. We have cost effective and executive options so that there’s something for everyone. We care about our customers and we want to help people. So let us help you organise those events and give you one less thing to worry about. Of course the fitted golf shirt is not just for women. A fitted shirt is one that fits snuggly against the body rather than being a loose cut and can be for any gender. This adds a little more form and a little less function to a golf shirt. But that’s not a bad thing, not by a long shot! Having a more fitted golfer makes for a really stylish corporate uniform shirt, one that’s more suited to an office environment than a standard, loose cut golfer would be. Higher weight fabrics tend to be of a higher quality, but stitching is also an important thing to look at because the seams are where a garments bear the most stress. Especially on the shoulders. Way back in the day, the uniform for playing tennis in was much more reminiscent of a business suit than today’s ensembles. It consisted of long pants and a long button up shirt and a tie of all things. All of it white, which inspired the name ‘Tennis Whites’. This experience was somewhat akin to playing sports in a straightjacket and was pretty uncomfortable. Which was why 7 time Tennis Grand Slam French Champion René Lacoste decided that enough was enough and designed a shirt that would be much more comfortable to wear when he was playing. What this ended up being is a light cotton shirt with a collar and placket that fir loosely and has a longer back hem so that it can be tucked into the back of the pants without pulling out when playing. That’s called a Tennis Tail! He premiered this look in 1926 and as you can probably guess, it won game-love. But then how did it end up being called a golf shirt? Okay, fair enough. Lacoste began to mass market his awesome design, complete with his signature crocodile logo (After his nickname, the crocodile) and it quickly caught on in the world of tennis. But tennis players weren’t the only one sitting up and taking notice. At the time, Polo (still not golf) players were also wearing very bulky, restrictive clothing while they played, which resulted in a lot of sweaty gross uniforms. Polo players were quick to latch onto the design and make it their own, changing the collar a bit and altering the fabric so that it suited them more. This resulted in Polo shirts! At last the shirt filtered down to golf players. It took a while because as a gentleman’s sport, golf had a fairly rigid dress code. On the other hand, a shirt like this does make it a lot easier to play and allows for much freer motion than most garments. The golf shirt was adapted when a pocket was added to the breast, to carry a small notebook and pencil in so that you can keep score. Dri-FIT is the name that Nike has patented to for their moisture management or water wicking range of clothes, just the same way that Puma has CoolCell. What it all boils down to is the way that the fabric is made and the type of fabric that it is. Water wicking fabrics are generally synthetic because natural fibres like cotton are very often absorbent and would retain the moisture rather than moving it on, and we all know how uncomfortable a wet shirt can be. And that’s the last thing you want in the office on a hot day. Which is where water wicking fabrics come into it. The fabric is designed with capillaries, like the human circulatory system. The moisture moves through these and is taken away from your body. That means that you’re kept cooler feeling more ready to take on the day than you would be in an uncomfortably wet shirt. If your job involves a lot of physical activity then a corporate golf shirt could very well be your Holy Grail of uniform shirts. You can move in it, it’s cut to circulate air around your body. And we offer moisture management options so that you can get the most out of your corporate uniform. Cotton is an incredibly popular fibre and has been for a long time. And it has remained popular for very good reason! The cotton bush produces fluffy balls of fibres which are then all brushed together and woven together. It’s a strong, natural fibre that’s biodegradable, which makes it a more eco-friendly golfer than a synthetic option might be. We offer a stunning range of golf shirts that range from 100% Cotton Golf shirts to polyester and cotton blends. Cotton fibres are also naturally quite pale and really receptive to dyes. This means that you can easily get the fabric to be the colour that you want it to be when you dye it. This is even truer of mercerised cotton, which has a wonderful, luxury feel to it. South Africa has a Mediterranean climate, which means that we have hot summers. Summer time is the perfect time to have a cotton golf shirt because the fabric is light and breathable. On top of that, the cut of a golf shirt is designed to circulate air beneath it, so you get double the cooling power. Yes, it’s cotton, but what’s so special about it? Mercerised cotton is treated with sodium dioxide which is then neutralised in an acid bath. This makes the threads well so that they’re shorter, but it also makes them glossy, soft and strong, as well as more receptive to dying. If you’re looking for Mercerised cotton Golf shirts in Johannesburg then we have a selection on our Brand Innovation website for you to choose from. The band proved that Plain White Tees can really make a hit. 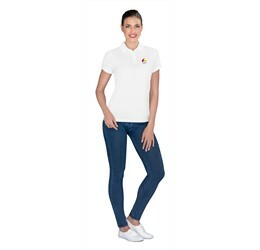 Plain golf shirts and white golf shirts are also perfect items of corporate or promotional clothing. The joy of a plain golfer is in the branding. We have a whole range of different branding options that include embroidery, screen printing and even laser engraving. Laser engraving? It sounds like something that we should offer on metal or wood products (we do). But we do like to be on the cutting edge of branding so that we can give you the most creative and varied options for your products. Barron does everything that you need for your corporate workwear. You can have your perfect workwear uniform at Barron Golf Shirt Prices. Which are good, because we want to get you the best price for your products. Barron Golf Shirts can be everything and anything you want them to be, including luxury, mercerised cotton. Mercerised cotton has been treated with chemicals that make it very soft and luxurious. It also strengthens the fibres of the fabric and gives them a gorgeous lustre. Of course, being a brand that caters to all needs, Barron Clothing also has a range of High Visibility Golfers. Hi Vis Golfers are great workwear shirts and are ideal for construction companies. When taking into account golf shirts for construction work or workwear for mining companies, it’s important to take into account the safety of the employees. That’s why high visibility fabrics are such an important part of these particular shirts. On construction sites there can be reduced visibility due to rubble and dust. The reflective accents and neon colours of construction workwear may seem a little odd at first glance, but they’re for the safety of the company’s employees. It’s hard to miss someone walking around in acid yellow with day-glow strips attached to it. And that’s exactly as it should be. Construction work often leads to companies heading off to different locations to do work. Locations where the employees are not always known. This is why it’s important to have a uniform for construction work. It keeps your regular day clothes clean. It also makes you easily identifiable as an employee of that country. This is important for safety and security reasons. On large sites there are often many different contractors working at once. Plumbers, electricians, builders, all of them have a place on the building site. Having a workwear uniform makes it a lot easier to control who is on the site because you have visual indicators that a person is supposed to be there. And again, that high visibility golf shirt comes in really handy for knowing where everyone is, not only for security but for the safety of your employees. Corporate Clothing Johannesburg – In a city that’s so bustling with businesses a corporate uniform is a great way to identify which company you work for. It’s also a great way to advertise your business. A uniform is a great way to advertise as well as draw attention to your brand. It makes your company easy to spot when someone is looking, it makes it easier for someone who needs help from your company to identify employees when they’re looking for them and it is a great way to give your employees a sense of pride and unity. Corporate clothing can be anything from a full on three piece suit to a t shirt with your company’s brand on it. A great way to keep a balance between those two extremes is with a golf shirt. A golf shirt walks the fine line between being a formal shirt and a casual shirt. It has the collar that makes it look more formal but at the same time it’s made out of fabrics that would generally be considered more casual. 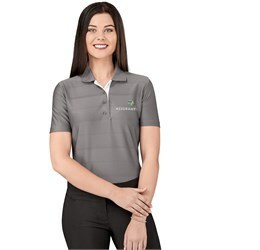 We have 100% Cotton Golf Shirts as well as Mercerised Cotton Golf Shirts, as well as having polycotton blend golf shirts and golf shirts that are made completely out of polyester. Corporate clothing is a varied and many faceted thing, but the fact of the matter remains that you can’t go wrong with a Golf Shirt. They look great when they’re branded. The really great thing about golf shirts, aside from everything about them, is that they’re really versatile. Yes, they were originally intended to be used as sports shirts but they look really formal. It’s that collar, it’s like waving a magic wand at a t shirt and suddenly it’s smart. Being the fancy cousin of the t shirt has often lead to a golf shirt being called a golf t shirt. And with good reason. It does have that distinctive T shape to it that gives the t shirt its name. But it also has the collar that makes these really beautiful for smart casual events and for office wear. But what also sets a golf t shirt apart from a regular old t shirt is that golf shirts are usually made from thicker fabric than regular t shirts. This makes them more durable and more suited for long wear the way a uniform needs to be. 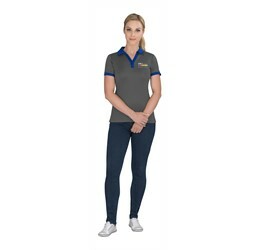 You can of course get promotional golf shirts that are made from thinner fabric and are more cost effective, the same way you would get promotional t shirts, but for a uniform that’s going to be worn every day, the thicker the fabric the better. Fabric thickness is measured by weight (it sounds strange I know, but bear with me here) or by grams per square metre. That gets shortened to GSM most of the time. For example, one of our stunning 210gsm golf shirts. That should give you an idea of how much the shirt will weigh, and it lets you know how much fabric is used in making that shirt if you weigh it. Thicker, denser fabric that has more threads in it so it will weigh more. This is usually a fairly good indication of the quality of a shirt. Looser weaves with fewer threads will weigh less. They will also be more cost effective, so if you’re looking for a promotional golf shirt then one with a lower gsm might stand you in good stead. Especially if it’s a one-time event. The Fabric of a Golf Shirt can also have different properties, like moisture management and sun protection, or whether they’re synthetic or 100% cotton. And we have them all! All of these options are ones that you can choose from when you buy from us. We pride ourselves on having a wide range of stunning garments for you to choose from so that you can have your perfect corporate golf shirt. Corporate Uniforms Johannesburg – Corporate uniforms are a great way to bring your team together. Having a single, unifying uniform, is a great way to promote team spirit and single mindedness. When you’re on a sports team, you uniforms – even if it’s just shirts or skins for practise – give you an understanding of who your team mates are and who shares a common purpose with you. When you’re wearing a uniform you all stand for the same ideals and share the same goals. To have fun, to win, it’s us against them, but in a more constructive environment where good sportsmanship is encouraged. There’s more to corporate clothing than just your standard suit and tie. In fact, many offices in South Africa don’t wear ties. Which is completely understandable. We live in a country that can get really hot in summer, especially if you’re inland. Gauteng is famous for its summer afternoon thunderstorms, which are usually preceded by warm, muggy heat. Not the kind of weather that you want to be wearing a tie in. South Africa is also a country where people work hard, and they work with their hands. From our farms to our offices, we’re all working with our hands to create a better South Africa. So whether we’re in the office working with documents or out there working on construction sites, the work environment of the modern South African is one where we want to be able to wear something that allows us to do our work, not something that holds us back from it. A corporate uniform – from the Latin, meaning Single Shape – encourages those same values within your staff. It gives your team a single purpose to work towards and a great way to keep motivated and work towards their goals. A golf shirt as part of the uniform is a great way to do this because not only does it make everyone look smart and ready for action, but it also allows them the freedom of movement to go out there and get the job done in their stunning corporate uniforms Johannesburg. Golf Shirt Suppliers Johannesburg – where to get these awesome shirts? Where can you get them branded and in the right colours? Do you want cotton or polyester? Do you want locally produced products? If your answer to any of those questions is either, ‘yes,’ or, ‘please tell me!’ then never fear, Brand Innovation is here! We have a mind blowing selection of golf shirts, from international to locally produce and in a range of colours that will make you think you’re looking at a Photoshop colour wheel. We have a wide selection of branding options available for our different shirts and they all look fantastic. 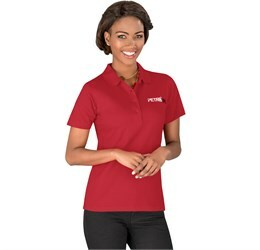 From embroidery to screen printing, debossing and laser engraving, we aim to give you the best possible selection of products and branding options so that you can have your perfect corporate uniform from the best Golf Shirt Suppliers Johannesburg. Golf Shirt Brands– we stock a selection of top quality brands that look and feel amazing will make your brand look absolutely fantastic. When you’re picking your corporate uniform, it may be tempting to waive the idea of brands. You’re putting your brand on it, right? Surely that will be the brand? Which is a fair point, but to counter, when you pick a branded shirt to put your brand on, you’re choosing to invest your money in the reputation that that brand has. In the history of quality that they present you with. That’s why we aim to offer you the best in high quality brands so that you can trust that you’re getting a top quality uniform from a company that has a reputation for great service and delivery. Here are a few of the awesome brands that we have on offer for you, waiting in the wings for your brand! Gary Player Clothing is a brand that is built on the back of one man’s hard work. Gary Player is a South African golfing legend who produces his own line of clothing, which is locally produced in South Africa and is made up of good, high quality products. Included in this are his leather bags and his exceptional golf shirts which are as beautiful in the board room as they are on the green. A Gary Player product is a joy to wear! If you’re looking for Gary Player Golf Shirts in Johannesburg, then we have a range of his beautiful golf apparel over on our Brand Innovation web site. The man himself is also a philanthropist and a big believer in hard work. When told that he had had a lucky shot, Player replied with, “The harder you work; the luckier you get.” Golf is a game of skill. And skills take years of practise to hone. Of course, Gary Player produces more than just golf shirts. He also has a beautiful range of golf towels and leather golf bags. The Gary Player Brand has great quality golf clothes and golf bags. The shirts that he produces are all made in South Africa, which is a great way to support local industry! He founded the Player Foundation in 1983, which raises funds to provide education, nutrition and sporting activities to a small, underprivileged community on the outskirts of Johannesburg. Since then the foundation has grown in leaps and bounds and now provides for underprivileged children and communities the world over. Most of the funds are raised through his invitational golfing events. Barron Clothing is one of the most trusted brands on the African Continent. And that’s no small area. Barron clothing has been in business for over 25 years and specialises in good quality workwear products. That makes it a great brand to use as a corporate uniform. When you’re looking for something that can be both durable and beautiful then Barron Clothing is a great way to go. On top of all their hard wearing products, they also have a really beautiful selection of luxury products, like their double mercerised cotton shirts. Slazenger is a high quality brand that has been around since 1881 and is one of the oldest sporting brands in the world today. Which is an impressive achievement as having being supplied the chief supplier of tennis balls to the Wimbledon Tennis tournament since 1902. They have a long standing relationship with sports like cricket and golf. It’s also known for producing hockey gear. Slazenger is well known for being great quality. Slazenger makes an impression and is well known for its quality. We often have requests for Slazenger products because they are so well known. Having a Slazenger bearing your brand is a fantastic way to showcase the best side of your brand. Slazenger Clothing is a very well-known sporting brand that has been around for well over a century and a half now. They produce beautiful sportswear and sporting accessories and even provide the tennis balls for the Championships at Wimbledon. They also make golf balls and a really stunning range of golf shirts that look seriously good when branded. Slazenger clothing is a real winner for quality and it makes a wonderful part of a uniform. Cutter and Buck Clothing is a brand that is incredibly popular with golfers, and is in fact geared specifically towards golfers. It’s the kind of brand that both looks and feels good and is designed with the sportsman in mind. These stunning shirts focus on combining modern and classical by blending modern techniques with classical design elements to put Cutter and Buck on the cutting edge of golf shirt technology. There are a lot of different things that go into making a golf day. It’s a lot of organisation and preparation. Brand Innovation can help with that by providing you with the following. And all of them branded for your company. Having company branded merchandise can really make an impression on a potential client or business partner. Branded gift bags are a really great thing to have with you on your golf day, and you can fill them with all sorts of fun goodies and golf swag. Swag is the American name for promotional gifts. These can be anything from branded sunglasses – we have some gorgeous promotional sunglasses that come in a wide range of colours that will go really well in your corporate goodie bag. We also have golf towels, caps and branded golf balls! And most importantly of all, we can brand sunscreen lotion for you so that you can protect your skin and not go red while you’re on the green. A golf day is a corporate event that involves gathering either your staff, clients or business partners, sometimes a combination of all three, together for a fun day of playing golf and networking. Golf is a really great sport for this kind of occasion because playing golf is physical activity. Physical activity produces hormones like dopamine and serotonin that are linked with the emotion of happiness. These hormones relax people and improve their moods, making this a perfect opportunity to network with people! Another great thing about golf is that you can tell a lot about someone when you play with them. Golf is a game of strategy, skill and patience and how someone plays and how someone reacts when they play can tell you a lot about their personality. Which makes it an awesome tool to use when you’re engaging with your clients or partners. Add to this a promotional golf shirt to commemorate the event and you’ve got a recipe for success. A golf shirt can be used as a great way for someone to remember all the fun that they had at your golf day, and they’re also a really great way for everyone to feel like one great big team. That way there won’t be too much rivalry if they’re all playing together. Branded Golf Shirts make for fantastic uniforms, and we have a wide range of different methods that we can use to brand your golf shirts for you, so that you can get your ideal result. We can screen print onto your golf shirts for you. Screen printing is done by using a stencil made out of mesh screen to create a pattern on the shirt for you. Screen printing works best on large, bold logos with minimal fine detailing and no gradient colours. As each colour is pushed through the stencil individually, screen printing is more expensive the more colours that are involved in the printing. Every colour requires a new stencil and the machine to be set up again. This is why a single colour screen print is the most cost effective. It also looks fantastic. Embroidery is another one of the methods that we can use. Embroidery can take place in up to nine colours and is charged by the number of stitches used in creating your brand rather than per colour. Embroidery is a beautiful, classic branding option and it looks amazing on golf shirts. You must be joking? With the heat of our South African Summers, a long sleeve shirt seems a little impractical. But it’s exactly because of how hot it gets that a long sleeve golf shirt is such a great idea for summertime. South Africa has the second highest instance of skin cancer in the world. That’s second only to Australia, a country famous for being scorching hot. The more of your skin that you cover up, the less risk you have of being burnt by the sun’s rays. Having a long sleeved golfer is a really great way to take care of people and show them that you care about their health and wellbeing. Sun burn is possibly one of the least fun experiences your skin can have. It’s painful, dangerous and can have a long lasting effect on your appearance. And I’m not just talking about a tan here, sun damage is permanent and not pretty at all. Which means that a long sleeved golf shirt is a great idea. We also have a range of golf shirts with a corporate golf shirt with sun protection built into it so that it can work even harder to protect your skin. Sun protective fabrics are either made from a very high Denier (remember how we talked about gsm? Denier is also a method of measuring the thickness of the fabric) so that it blocks out the UV rays, or has been treated with ingredients that inhibit UV Rays. Your clothing can act as a shield against the outside world, and having that extra protection against ultraviolet radiation is a great way to take care of people, particularly if you’re providing shirts for people who are going to be outside a lot. 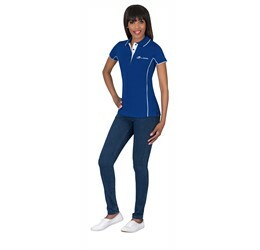 Using a UV treated golf shirt as a part of your corporate uniform is a really great way to protect your skin. These are a selection of fabrics that offer UV protection, not necessarily because they’re UV treated but because of the natural properties of the fabric. Brand Innovation has a selection of ladies and Mens Long Sleeve Golf Shirts. These golfers are great for summer when they keep the sun off your skin as well as in winter when they can be layered up to keep warm. Golf Shirts are great for teams, and not just the ones on the sports field. Though they are great for those too. Then what teams? Corporate teams! Team building exercises and camps are a really awesome place to have a corporate shirt like a golf shirt. Especially if you’re going to be playing games and doing obstacle courses the way team building boot camps often do. That kind of physical activities are an ideal place for a corporate golf shirt that will identify your company and your team while still giving you the freedom to reach for those monkey bars. Team building exercises often get really physical, building rafts, going canoeing and running races. While you’re doing all that you want to feel like a team, and you want to look good (no doubt there will be photographs taken at this event so you want to look your best), but at the same time, standard office suits and ties just aren’t practical gear to be doing this kind of exercise in. Why is sport great? The sad truth is that if you ask a lot of high school students about their activities, they’ll tell you that the only reason that they do sport is because it’s compulsory. The even sadder truth is that there are schools out there that aren’t able to offer any kind of extracurricular sports for their students to do because they can’t afford to pay for coaches, facilities or equipment. But the benefits of getting out there and playing sport are really incredible. Playing sport can change the way you stand, your physical health and even the way that you feel about yourself. The physical exercise can help you to improve your physical fitness. Obesity is a growing concern the world over and regular exercise can help you lose weight as well as improving your posture and the way you carry yourself, which can in turn can improve your confidence. Studies have shown that standing more confidently can change the way that you conduct yourself. Becoming fitter doesn’t necessarily mean losing weight; muscle weighs more than fat. But you’ll be able to see the change in your body, and that change can improve your self-confidence. Being fitter gives you more energy, and can make you more confident in yourself. Physical exercise also increases the production of serotonin and dopamine, the happiness hormones. This lifts your mood and can help to combat depression as well as lifting your overall mood. Being fitter can also help your recovery time when you’re injured. A friend of mine in her seventies broke her hip after being knocked over. Her doctors noted that she healed remarkably quickly after the injury because she had very strong bones. This was because even in her seventies she still walked ten kilometres a day. Then you’re definitely in the right place because we can supply if for you. If you’re looking for corporate clothing in Cape Town or the rest of South Africa, then our Brand Innovation website will have more options for you. Golf Shirts are a fantastic branding option that looks good, feels good and has a long history of being both practical and looking good. For a branded corporate uniform shirt, the golf shirt is a winner. And with us you can choose from a wide selection of beautiful shirts that come in wonderful colours and have different fabric options to best suit your needs. When you’re looking for a product to represent your brand beautifully, then a great choice is Golf Shirts Johannesburg.